Einherjar - The Viking's Blood blog | http://www.ein-herjar.com/ Einherjar is an all Japanese webgame combining turn-based tactic and RPG elements. http://www.ein-herjar.com/ Einherjar is an all Japanese webgame combining turn-based tactic and RPG elements. 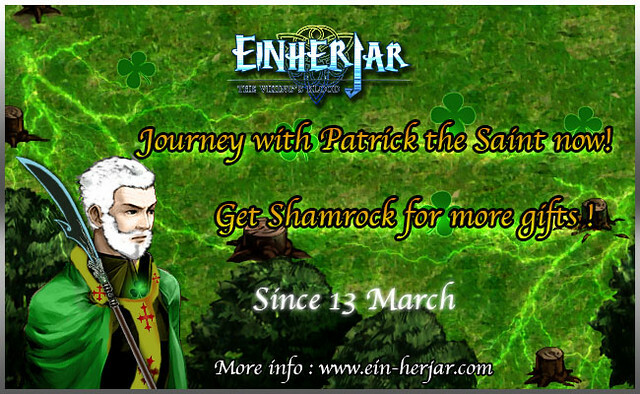 Saint Patrick’s Day is near and to mark one of the biggest religious day, Appirits has just announced an in-game event based on this them for their browser game Einherjar – The Viking’s Blood. The event will run from 13 to 27 March 2013 (GMT+8) with details as below. Saint Patrick is said to have used the shamrock, a three-leaved plant, to explain the Holy Trinity to the pagan Irish, and shamrock has become a ubiquitous feature of the day. So once players summon successfully Patrick at the square, they will have 1 Shamrock to exchange gifts at the event tab. With those stats and skills, Patrick can be considered as one of the strongest heroes in Einherjar world. Therefore players should try using the summon function (Power charged) to obtain both Patrick and the new material Shamrock to get more benefits in the game. About Einherjar: Einherjar – The Viking’s Blood is a browser-based game combining smooth turn-based tactic and RPG elements that let players start as Viking leaders and strengthen their Viking clans. Players must train their armies through numerous battles and master tactics for each type of map to subjugate their opponents and forge a vast Viking empire! Appirits (formerly known as KBMJ) is a corporation specialized in developing Internet systems and services. 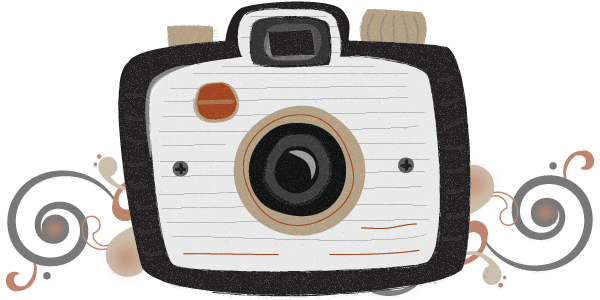 Appirits has participated in the web game market since 2010 and is creating many new games with nearly 11 years of experience in the web industry. Appirits, the Japanese developer of the turn-based browser game Einherjar – The Viking’s Blood has just released several big updates for the game in order to improve gaming experience for their community since 6 March 2013 (GMT+8). The update phase includes several factors regarding a new building, some monster units and other new items and equipment. Details are as below. First of all, there will be more new fighting units joining in the game’s world. They are monsters that have been defeated by Einherjar heroes and now have surrendered their evil path to fight alongside with players. They can be summoned by gold from a brand new building called MONSTER SQUARE. For this update time, those new monster units include Fairy -> Sylph -> Dark Sylph/High Sylph, Undead -> Skull Viking -> Dark Night, Ogre -> Juton -> Ymir/Muspel. In order to transform those monsters to upper classes, players will need to train and sacrifice them to obtain respective Monster Souls then produce Monster Proofs from them. And they can have monster units mate with each other to inherit stats and skills like other normal units. Secondly, the hero summon will be adjusted properly to bring players more benefits when using Power. From now on, elite heroes with special skills (Lightning Attack, Direct Attack, God Luck, etc.) will be ready to be summoned at the square at a certain rate, making players’ Power consumption more valuable. Power is a feature which gives players several in-game advantages like recruiting stronger units, boosting training time, etc. Thirdly, new skills and crystals will be also updated, including Magic Counter Attack, Magic Filter, Grudge, HP Up, and Spirit Defense. However, 3 skills namely Spirit Defense (Fairy), HP Up (Ogre) and Grudge (Undead) will be inherited only along units of the same job. So players should pay attention to that when planning next generations of their monster fighters. Moreover, now by having units perform training at homebase players will be able to collect God Bloods (Odin, Freya, Thor) in order to develop their Viking units. And another important improvement is in the sacrifice ceremony. By sacrificing warriors, they will be likely to receive special materials like Strength Blood, Tec Blood, Agi Blood, etc. in addition to normal Soul Chalices. However, that will be based on the randomness. And the last is a small update for Edinburgh market that now will exhibit more armors for players to purchase. Although they are not extremely powerful items which can be only earned through long progress of collecting and production, they are still a good choice for players at low levels. Appirits, the Japanese developer of the turn-based browser game Einherjar, has recently released several necessary updates related to Lord House, Summon Square and Reward System for the game since 27 February 2013 (GMT+8). First of all, the Lord House’s max level is raised up to 8. That means now players can store more items and materials for their adventuring time in Einherjar. It is very important and convenient if they want to produce more equipment for their Viking units. So it is recommended that players should try to level up their Lord House as soon as they can. Secondly, another update relates to the hero summon which may be the matter that all Einherjar players pay the most attention to. By using Power, they can recruit elite heroes and braves that can bring big advantage on battlefields. And now, with the aforesaid update time, the Square’s max level is increased up to 5. And there is more benefit to it BUT that will only be clear after the game’ next maintenance day (6 March 2013 GMT+8). Therefore, level up the Square house should be an urgent task for players for now. Thirdly, there will an improvement for Einherjar’s current reward system for top 10 players on the weekly ranking table. New players can learn about the system at the game’s official site. The game developer has decided to adjust it by adding more valuable items to the list of rewards in order to make it more suitable to the current levels of top players. Being in the top 10 can help players prove their power and bring them even more rewards. In addition, some in-game benefits have been applied to mark the moment of those updates. From 27 February to 6 March 2013 (GMT+8), all players who log in Einherjar will have their experience points in expeditionary battles raised by 20%. And the same will goes for the item drop rate of those fights. ‘Enhanced Plates for Viking Warriors’ event released in Einherjar by Appirits Inc.